If you renew prior to 20 October 2014 you will receive an early bird discount of $20 which will be deducted from the amount you are told to pay - DO NOT DEDUCT A FURTHER $20! If you pay by direct credit please remember to pay at the time of renewing to enable quick reconciliation at our end. Click renew membership and follow the instructions. Your new card will be sent to you ASAP - please be patient as there are more than 850 of you all trying to renew at the same time. Please carry your card at all times when flying. We look forward to receiving your renewal and wish you a happy 2014/2015 flying season. Best Wishes from the executive of the NZHGPA. Minutes - Annual General Meeting and Extraordinary Executive Meeting of the 9th August 2014. 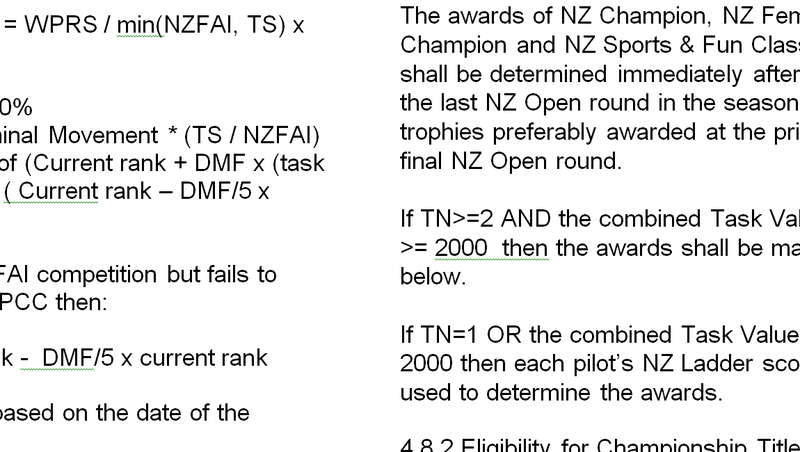 The official rules for New Zealand Paragliding Competitions have been updated to version 14. As you all know membership renewal is fast approaching. We are looking for a new photo for the front of this year's membership card. We would prefer a photo that has both codes, ie HG & PG in it, but if necessary we will have to take year about. The photo must also be your own and not downloaded from the internet - we can't have any ownership issues regarding the photo. Please send your photos to me at admin@nzhgpa.org.nz by 20th September and be in with a chance for your pic to be on the next NZHGPA membership card.